As an annual or monthly co-op member, not only do you have access to repeat discounts of 10% to 25% at participating small business in your communities, your membership money is being invested in other opportunities to earn you multiple streams of income for simply supporting the small businesses in your community and referring others. Below are the opportunities you are paid into through your Co-Op membership. 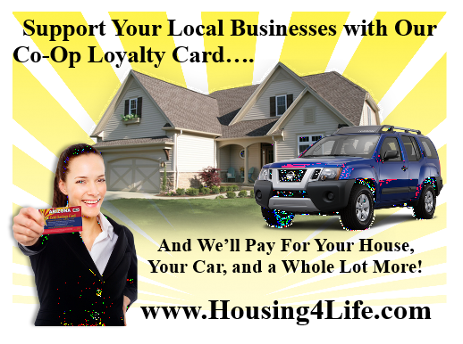 The first program you are paid to, directly tied to your monthly or annual Co-Op membership, is the Housing4Life Co-Op. Instead of for an Entertainment.com coupon book every year and your money going to a CEO and company employees, we're investing your membership dollars into YOUR future. We want you to have a home, affordable healthcare, groceries on the table, and much more. The Housing4Life Co-Op does just that. As you advance through this multi-tiered cycler program, you will earn the cash from every cycle straight to your Paypal account to help pay off your mortgage or you can save it to pay for your dream home. We'll also put an amount of money from each cycle into a Healthcare Co-Op Care account to pay for your healthcare expenses with that credit at 100%. You'll also earn PAID entries into the "Meat of the Month" Club, "Gift Card a Month" Club, and "Movie a Month" club opportunities for more earnings and benefits. 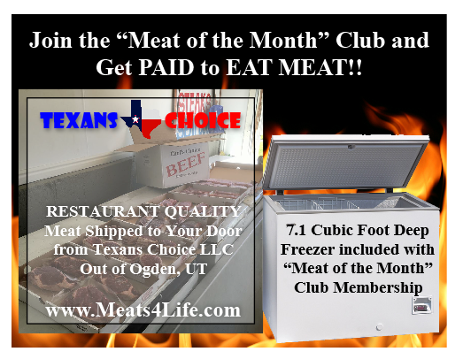 Paid into the "Meat of the Month" Club by your membership in the Housing4Life Co-Op, as you cycle through this program, you'll receive deliveries of RESTAURANT QUALITY meat to your doorstep and cash bonuses. Included are 3 additional bonuses: A NO COST laptop/printer combo, a deep freezer, and a bbq grill, one item per every 4-cycle phase. You'll receive $2500 cash bonuses every completed 4-cycle phase as well. Additionally, you'll receive PAID entries into the Groceries4Life program for extra earnings to put food on your table; access to downloadable cookbooks; printable grocery coupons right from our website through Coupons.com, Redplum, and SmartSource; and another PAID entry into the "Gift Card a Month" Club for double the rewards. 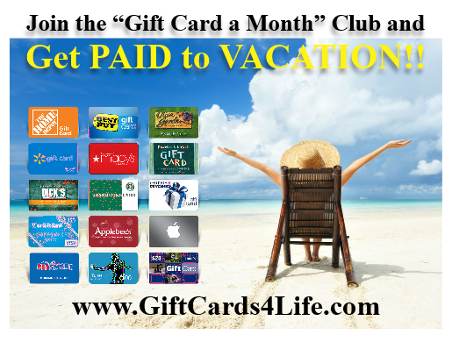 Paid into the "Gift Card a Month" Club by both the Housing4Life Co-Op and the "Meat of the Month" Club, the "Gift Card a Month" Club is your literal ticket to unlimited streams of gift cards to your favorite venues for dining, shopping and entertainment (family friendly) to your mailbox and paid vacations to anywhere in the world. There are 4 Gift Card levels in the program, $25, $50, $100, and $250. There are 4 cycle in each level, each cycle rewarding you with a set number of gift cards in those particular denominations. At the end of each level, you are awarded a bonus of either cash or a vacation package, valued at $1000, $2000, $4000, and $10,000 respectively. Additionally, for every completed 4-cycle level, you will earn paid entries into both the Housing4Life Co-Op and the "Movie a Month" Club, nearly completing a circle of opportunities. Enjoy watching movies as soon as they hit the big screen without spending a dime out of pocket. 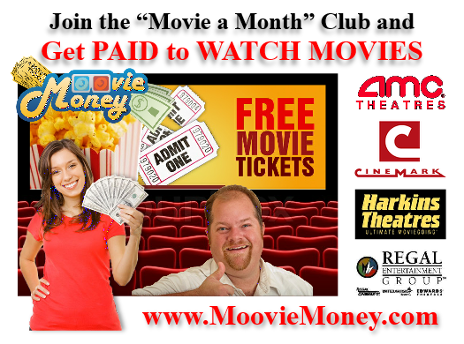 Since you're being paid into this AWESOME program as a participant of the "Gift Card a Month" Club, you'll receive endless streams of movie passes to your mailbox and annual $500 rebates at the end of every calendar year when you mail in your saved movie ticket stubs. You'll also receive PAID entries into both the Housing4Life Co-Op AND the "Meat of the Month" Club, completing the Savings4Life Circle of opportunities.